The objective of this study was to determine the magnitude of groundwater arsenic contamination in Shahpur block of Bhojpur district, Bihar state, India and its health effects such as dermal, neurological, obstetric effects, and cancer risk. The School of Environmental Studies (SOES) collected 4704 tube-well water samples from all 88 villages of Shahpur, which were analyzed for arsenic. We found 40.3 and 21.1 % of the tube-wells had arsenic above 10 and 50 μg/l, respectively, with maximum concentration of 1805 μg/l. The study shows that 75,000, 39,000, and 10,000 people could be exposed to arsenic-contaminated water greater than 10, 50, and 300 μg/l, respectively. Our medical team examined 1422 villagers from Shahpur and registered 161 (prevalence rate, 11.3 %) with arsenical skin lesions. Arsenical skin lesions were also observed in 29 children of 525 screened. 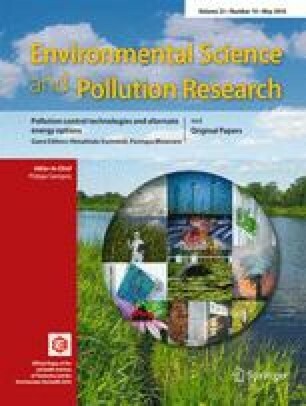 We analyzed 579 biological samples (hair, nail, and urine) from Shahpur and found that 82, 89, and 91 % of hair, nail, and urine, respectively, had arsenic above the normal levels, indicating many people in the study area are sub-clinically affected. Arsenical neuropathy was observed in 48 % of 102 arsenicosis patients. The study also found that arsenic exposed women with severe skin lesions had adversely affected their pregnancies. The carcinogenic and non-carcinogenic risks were also estimated based on the generated data. Safe drinking water supply is urgently required to combat arsenic situation in affected villages of Shahpur. Thanks to Hamdard National Foundation, India for the award to Dipankar Chakraborti of INR 5 million to continue arsenic research work in India. We thank Dr. Morrow Dong, University of Newcastle for checking the equation to estimate risks.